Two individual GRIFTA units snap together to create an uncompromisingly ergonomic gamepad. The hand-grip format allows us to place eight extra buttons (four per side) that are right underneath your thumbs. The D-Pad ABXY buttons are precise mechanical components and can be pushed way faster than the usual silicon switches. 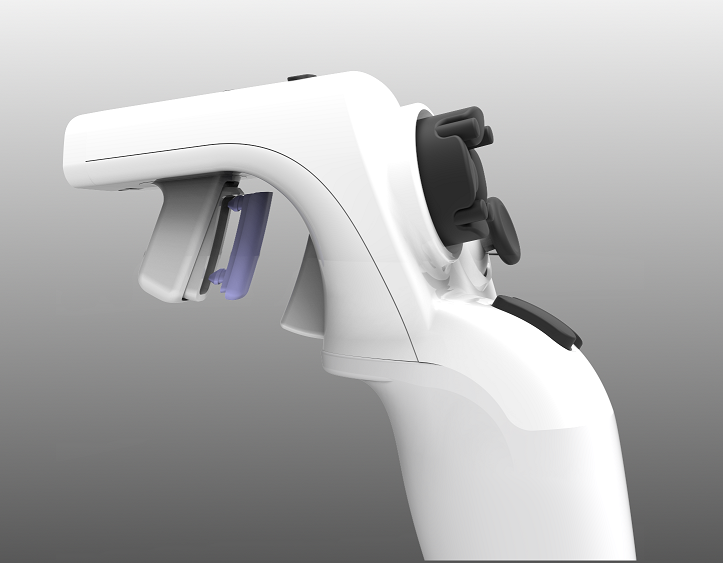 The shoulder button is situated behind the index finger and can be modified with soft silicon inserts which are provided in five different sizes. When a GRIFTA unit is configured in keyboard-mode it brings accurate gameplay to the couch. Relax, put your feet up, place your gaming mouse on a book and play with the speed and precision that only a mouse can offer. This attachment tracks translational and rotational movements via three IR LEDs for pointing and shooting. High power IR LEDs are needed to overcome any light interference. Powering such LEDs via the GRIFTA or a cable isn't practical; therefore the ANTLERs are equipped with integrated Li-Ion batteries. After two hours of gaming just swap out the whole module and clip in a fresh ANTLER. The ANTLERs are simple and inexpensive. They will be supplied in packs of two, together with a charger. Oculus Rift is using a very similar tracking-technology. This makes the GRIFTA a perfect match for Virtual Reality Applications.